For a better apprehension of the theory we propose in the next sections a fresh way to look at a physical event in connection with the time dilatation in a moving system. We will show that the Lorentz-Fitzgerald-contraction is a superfluous concept. This concept for contraction has to be replaced by the doubled influence of the time getting the same results as Einstein did and resulting in a gain of transparency for the Theory of Relativity. Its advantage is shown by the description of the Ehrenfest–paradox, where the rigid rotation stood out in Einstein's mind as an unsolved problem  and by the examples of the bending of light in a gravitation field and the derivation of the formula of the relativistic perihelion precession of Mercury. These are the same examples as Einstein used to promote his General Theory of Relativity. The formula is valid for every relatively small mass moving in an elliptical orbit around a big mass by the gravity of the last one. With the astronomical data in those days he found the relativistic perihelion shift being 43'' per century. This fitted well with the 45 ± 5'' which was found by the French astronomer Le Verrier  for the unexplainable part. In his article formally founding the General Theory of Relativity  in 1916, Einstein mentioned this agreement as a strong supporting argument for his theory. He was probably not familiar with the painstaking work of the American scientist Simon Newcomb  who revised and improved the work of Le Verrier and published already in 1882 exactly the same result of 43" per century. The theoretical value calculated with recent data is 42.98'' per century. 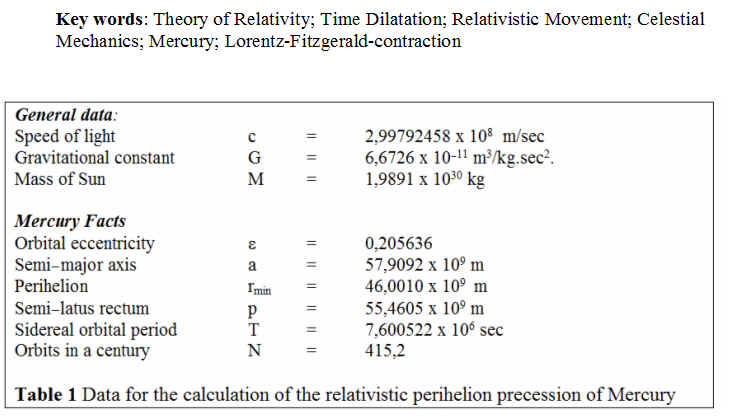 The explanation of the perihelion movement of the planets with the General Theory of Relativity was a big scientific success and since then there seems to be no doubt under scientists that the observations of the perihelion of Mercury should confirm the theoretical value! Otherwise the measurements are fault! In the present article however we show an improvement of the mentioned formula which leads to a new theoretical value of 43.59'' per century. You can show that of reasons of symmetry the absolute velocity of the moving system relative to the system at rest will be equal to the absolute velocity of the system at rest relative to the moving system. This means that the velocity of an object is equal to the velocity we have relative to the object. We will always use this fact. If we look at an object having a constant velocity we know from the theory of relativity that the time on the object is slower than ours. In the same time an observer on the object will measure that our clocks are slower than theirs. The moving system and the system at rest can be exchanged in this part of the theory of relativity. We will understand by 'our time' the time duration for an event on our clock, being the clock we take with us and by 'their time' the time duration for the same event on the clocks in an other (relatively moving or accelerating) system. An identical event in the moving system and the system at rest is marked by the different observers by the equal time duration on their clocks. All observers use identical clocks, which means that these clocks are running always just as quick when they are placed next to each other. I prefer to describe this common quality as: 'these clocks have in this situation the same 'time–velocity' . These clocks show if placed in different moving systems a different time–velocity. From the velocity of the moving object and its place in an accelerating field 'their time–velocity' can always be converted into 'our time–velocity'. ξ = γ. (x–v.t) meter. From this formula it follows that if a moving object finds itself at t = 0 sec between the points x = 0 and x = ℓ , so its length is ℓ meter in our system, its coordinates in the moving system will be ξ = 0 and ξ = γ. (ℓ–v.0) = γ.ℓ meter. So the moving object is larger in its ξ–coordinates than in its x–coordinates from the system at rest. Einstein interpreted this as if an object with length γℓ meter in the moving system had undergone a length–contraction to the length ℓ meter in the system at rest. Remark: the object is found in both systems at once. There is much confusion about the phenomenon of this so called Lorentz-Fitzgerald-contraction as we can notice in the examples of paradoxes based on this contraction like the 'tunnel paradox' , the 'ladder paradox' and the 'Ehrenfest paradox'. If an author claims to have solved them, the solutions always contradicts the physical reality. "The length to be discovered by the operation (b) we will call 'the length of the (moving) rod in the stationary system'. This we shall determine on the basis of our two principles, and we shall find that it differs from l. Current kinematics tacitly assumes that the lengths determined by these two operations are precisely equal, or in other words, that a moving rigid body at the epoch t may in geometrical respects be perfectly represented by the same body at rest in a definite position." See also [5 p 820]. This is a first argument against the Lorentz-Fitzgerald-contraction. For the second argument we need a physical–philosophical definition  for the principle of relativity . Our starting–point is the next axiom: every observer – independently of his situation of moving – will observe at some well defined and freely observable place the same sequence of physical events, this means: "All observers have to do with the same physical reality ". This definition leads to a principle of relativity that has to be understood as a ground rule for physics: "There is only one physical reality". Let us now execute a thought–experiment. Suppose the physical Lorentz-Fitzgerald-contraction holds, then we can take two dark screens that can move close along each other. The biggest screen contains a hole. The other screen has the same shape as the mentioned hole. If the last screen is placed exactly before the hole there is no light passing the screens. If the screens are moving relatively to the system at rest with the same but opposite velocity, there will come through no light at the moment the little screen passes the hole in the big screen, because both screens must experience the same contraction. The hole is completely covered by the little screen. If we imagine further a second observer moving in the system at rest with some intermediate velocity along the same axis as the screens then the screens have different velocities relative to this observer. Einstein used a limited definition by focusing on the physical laws which should keep their forms. This is called the covariance of the formulas. The screen with the hole is moving quickest so the hole is contracted more than the other screen. Then there will always be an epoch of complete interruption of the light. The little screen is moving quickest and will be contracted the most, so there will never be a moment of complete interruption of light. The real physical reality is: "there exists a moment of interruption of the light", as we consider to be proven for the situation the screens had the same but opposite velocity. This physical reality also holds – based on our principle – if one screen is at rest and the second is moving. The consequence is that the moving screen can not be contracted relative to the screen at rest. The screens keep their dimensions independently of their mutual velocity so the moving object (screen) has the same length as the object at rest as seen by the observers. The conclusion is that the Lorentz-Fitzgerald-contraction does not exist even as an optical illusion. In the next sections we will show on a closer mathematical and physical examination the real behaviour of the moving object as a result of the time dilatation. This will prove once again the superfluity of the Lorentz-Fitzgerald-contraction. If a physical event is happening in a system at rest, it can be watched from the moving system or reversed. The covering of a certain distance by a moving object is a special physical event that in the same measure can be attributed to the system at rest as to the moving system. It is a mutual event. The moving object is covering a distance in our system and our system is covering a distance in the system of the moving object. The time on our clocks – when the object has covered a certain distance in our system – has to be equal to the time on the clocks of the moving object at the moment our system has covered the same distance in the system of the moving object. The covered distance is an identical event for both systems if the time duration is equal on the clocks in both systems. In this context the concept of covered distance has to be defined: the covered distance of an object (or a phenomenon like a wave) is the product of the velocity of the object and the time–duration. This definition indicates that the covered distance can have another value in the system at rest as in the moving system. When we use the time duration on the clocks in the system at rest the covered distance is equal to the length of the distance between two points in that system. If, however, we use the time–duration on the clocks of the moving system the covered distance between the same points has a lesser value than the length of the distance because of the slower time–velocity of the moving clock. To reach the identical event of the same covered distance the moving system has to move on for some time. The demand that an identical event should have the same time duration in different systems is equivalent to the demand that the covered distance should be equal in these systems. With this concept we will analyze the time and the covered distance in a moving system. A train has the length l between the back B and the front A of the train. The 'length' is the distance between these points measured at rest. Suppose the point A is covering with the velocity v m/s a distance with the same length l measured at rest between two points K and L along the train's railway. The system KL is called the railway–system. Then the point K is moving with the same but opposite velocity between A and B in the train. The system AB is called the train–system. The clocks in the railway–system are synchronized, just as are the clocks in the train–system. At the moment A is passing K the indications of time at the clocks in the points K and A are defined as the zero–points of time TA = TK = 0 . We will show the course of the time in both systems in one graphical figure (fig.1). This is what we call the timeline–diagram. We see horizontally the X–axis. In this figure the interrupted line BA and its extensions presents the trains time and the solid line KL and its extensions the railways time. v << c the lines are laying very close to each other. Remark: the physical train and railway have their direction along the X–axis, the time–lines are making an angle with this axis and with each other. In the next timeline–diagram (fig. 2) we see at the right side of line PP the time–line of the train BA at the moment the point A of the train is passing the point L along the railway. On the synchronized clocks in the railway–system KL the time is T = TL = l/v sec because the train had covered with the velocity v m/s the distance l in this system. This is the distance–event in the system at rest: the distance l was covered in T = l/v sec. At the moment the clocks A and L meet each other, the time indications on these clocks mark this point–event. Every observer, no matter of his situation of movement, will observe these time indications on the clocks when they pass each other. This is the demand of our principle of relativity: "All observers experience the same physical reality ". When a 'neutral' observer looks at the scene from a point in a system with half the velocity staying at a place P (fig 3) he will observe as a result of the symmetry that at the moment A is passing L also the point K is passing the point B. There is no need to compute the times on the clocks of K and B because these must be – by reasons of symmetry – exactly the times already mentioned for A and L, but then exchanged. Note: The covered distance in the stationary system is γ times as big as the product of speed and time in the moving system. In my article  I showed where Einstein made the faults by formulating the special theory of relativity which got him to assume the contraction of a moving body. Besides we show the way for understanding it by the influence of the time speed on the units of time and covered distance in the moving system. In our view there is no place for the existence of the Lorentz-Fitzgerald-contraction of a moving object. The contraction of a covered distance can be understood completely with the considerations given before about the identical distance–event. In this way the dynamics of the theory of relativity will be simplified a lot. This section 8 is considerably improved. See the Dutch version. A translation will come if there is any need for it. In the theory of general relativity the bodies are subject to accelerating fields and Einstein also assumed wrongly that a rigid body will lose length along the direction of the acceleration. Einstein's pronounced scientific faith in the contraction of bodies is found in his article about the general relativity [7 p.161] . He writes: "The unit measuring–rod thus appears a little shortened in relation to the system of coordinates by the presence of the gravitational field, if the rod is laid along a radius." and some lines below: "With the tangential position, therefore, the gravitational field of the point of mass has no influence on the length of a rod." It is obvious that there is no rational possibility for the shrinking of the length in an accelerating field – which gives the object a velocity – when the object has not been shrunken when it has its velocity. An other question is what happens with its length when the object is not moving, like the objects at the surface of the earth. In this situation we can imagine the object is falling from a situation at rest till it reaches the earth surface. All the way of falling its length is not shrinking because the object conserves its length in spite of its velocity. So it saves its length also when it loses its velocity. Einstein's idea of a shrunken rod in a gravity field has to be rejected. The time speed at any point in an accelerating field can be calculated. It may be bigger or lesser than in our system at rest at the earth surface. Our considerations about the identical covered distance however do hold. They should be implicated however very carefully. So consider an accelerating field wherein the time–velocity has a deviation with a factor (1– α ) sec/sec compared to our time. To simplify matters let us assume that α << 1 . In this field a moving object with a velocity v is covering a distance with a length of l meter between the points K and L. We assume the velocity of the object is small so the resulting time dilatation can be neglected relative to that of the accelerating field. Further we assume the time speed between K and L is constant. The time duration on our clocks is T = ℓ/v sec. The co–moving clocks on the spot will show a time duration (1– α ).T sec. Realise this is a mutual distance–event for two free moving systems. The movements we observe from the moving object will be observed from the object to be the same for our system. 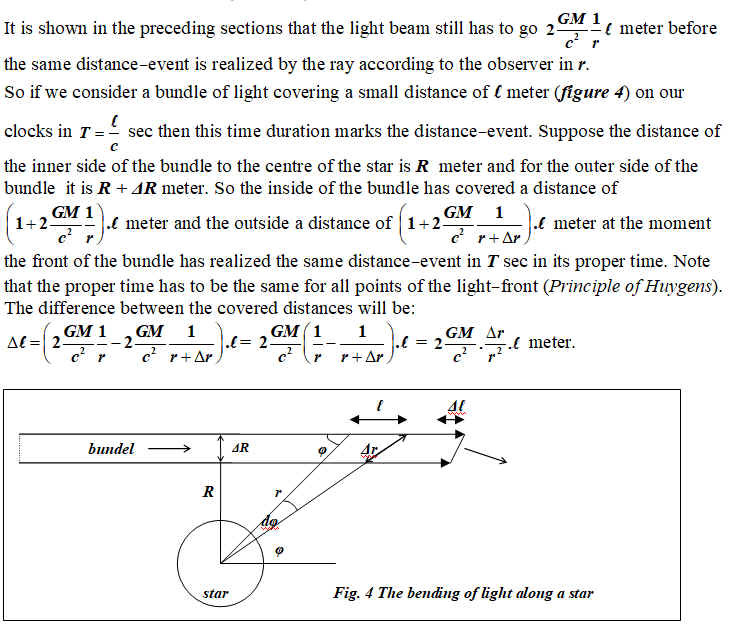 By the same logical reasoning executed in the preceding sections we will find for the object that the mutual event of a covered distance in T sec will be realized in a point 2 α .l meter passed the point L, so at (1+2 α ).ℓ meter. We will use this result in the next sections. In case the velocity of the object can not be ignored regarding the time–velocity, the time dilatations of the accelerating field and the velocity can be ad up algebraically. If the time speed in a field is not constant it can be computed for any point in the field by integration. Remark the general relativity can be handled in this way quite easy for the dynamics of moving bodies in space as an simple enlargement of the special theory of relativity. The next section 10 is considerably improved. See the Dutch version. A translation will come if there is any need for it.